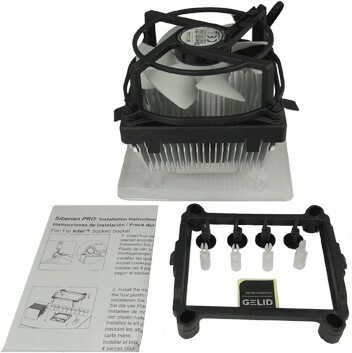 Extremely good value for money, the Siberian Pro CPU Cooler from Gelid is an ideal cost effective replacement for any stock cooler. 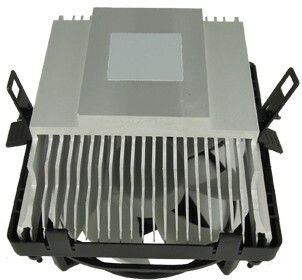 Gelid's Siberian PRO processor cooler boasts a low-noise top flow design. 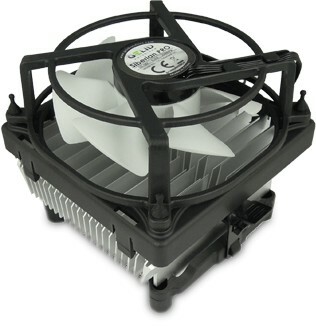 The cooler contains a silent 92mm fan with GELID intelligent PWM control and an appropriate premium aluminium heatsink. The optimised PWM intelligent control system achieves the best noise/cooling/price ratio in its class and allows users to set the fan speed in their BIOS accordingly. With a compact size and a height of just 89mm. it is especially well suited to HTPC and small chassis sizes. 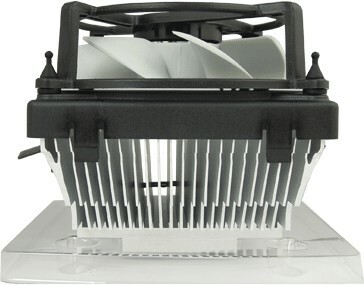 The fan of the Siberian PRO guarantees a silent operation and achieves high airflow. 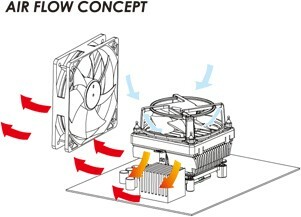 Thanks to the top flow design the Siberian also provides secondary cooling to the motherboard components located around the processor. Good product. Installation requires experience. I bought this cooler to replace a failing Intel stock cooler. I am satisfied with my purchase so far: the noise coming from my PC reduced significantly, even with respect to when the Intel stock cooler was functioning properly. I would like to discourage novices out there from endeavouring to install this cooler by themselves. This is not nearly as simple as installing an Intel stock cooler. For starters, you have a 50% chance of getting the 775/1155 choice wrong, because even if there are labels on the mounting bracket telling you where to point the plastic inserts, it's not clear which part of the plastic insert is supposed to be the "front". The mounting clips are a sadistic pain: just "pressing" them, as the manual suggests, won't work. They will be tamed only by a secure and experienced hand, and there might be simply not enough room on either side of the cooler for you to do it comfortably. Better than stock intel which is 60C TDP. Fits good, clears ram, very quiet. Mounts from front so MoB can stay in place. Check plastic pins, they can mount two ways. Turn tower cases flat so spring clips are easier to fasten. Better cooler will allow CPU to run faster, under automatic de-rating from BIOS. This cooler replaced a standard Intel 775 cooler that was a bit noisy. The motherboard is an older Asus Striker Extreme with copper pipes and fins surrounding the CPU that keeps the chips cool. I had already monitored the temperatures with the Intel fan running at full blast, and it ran too warm for my liking. The Siberian was dead easy to fit - only fiddly bit was locating the locking mechanism because of the copper pipes and fins. I set the fan speed to 50% and was pleasantly surprised to find the CPU and motherboard temperatures had improved by 40%. With the fan running at 1300rpm the CPU temp hovers around 50C whereas it was 90C with the Intel cooler running at approx 2400 rpm. Well pleased! My 8 year old Dell Inspiron 531 was beginning to sound like a helicopter, and under load (i.e. playing videos) it would get even worse, with reported CPU temperature in the 60C+ range. After fitting this heatsink & fan (very easily!) it's so quiet I can barely hear it and the temperature is much better. To fit an AMD X4 635, it comes *extremely* close to the RAM on my motherboard but clamps down nice and tight. My first cooler replacement, so not obvious how to fit but managed to work it out from the scant instructions, the picture on the side of the box and YouTube. Much quieter than the stock cooler fan and not a huge temperature difference under casual load but impressively brings the 400% CPU load temperature down from 70C to 50C.